SECOND ACT: Apart from his neat skills as a playwright, what we’ve always admired about David Tulloch is that he’s a man of his word. 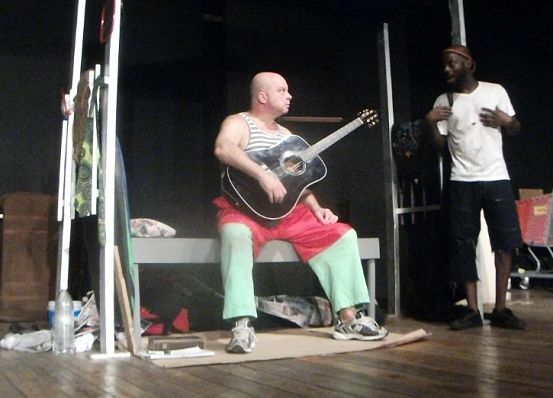 About a year ago, in a TALLAWAH interview, he emphasized that he and his Probemaster Entertainment team members had set their sights on opening their very own theatre space in Kingston, in the wake of the Pantry Playhouse’s sudden departure from the scene. A property on Ruthven Road seemed promising, but apparently that fell through. Now comes news that Haining Road’s long-struggling Theatre Place is about to find new life as the Phoenix Theatre, thanks to Tulloch’s visionary leadership and business savvy. From what we’ve gleaned, the theatre house is getting a solid makeover. New amenities are being installed to add to its overall appeal and to, more or less, maximize its potential. It’s about time. The first production to be hosted inside the renovated space, we hear, is a remount of Dahlia Harris’ Same Difference, which had a short run at Merle Grove High’s Karram Speid Auditorium in late December. Same Difference is scheduled to open at the Phoenix Theatre on Ash Wednesday, February 10. INCREDIBLE LEGENDS: The arrival of a new theatre production headlined by the incomparable Leonie Forbes is always cause for rejoicing. The Thespy and Actor Boy-winning actress is reteaming with her For My Daughter director (David Tulloch) and costar (Rosie Murray) to bring to audiences Not My Child, an emotional domestic drama that promises to provoke thought and tears. It’s the latest effort from Tulloch (writer/director/producer) and Probemaster Entertainment, which marks its 16th anniversary this year. With Bangarang heading on its national tour, Not My Child will play at Green Gables Theatre as of Feb. 10, the date also earmarked for the premiere of Dorothy Cunningham’s latest production, Mama Take Me to Church, a faith-based ensemble drama, playing at Hope Road’s YMCA. Cunningham was last seen in 2014’s Lotto Money (at Theatre Place), opposite Peter Heslop and Munair Zacca. 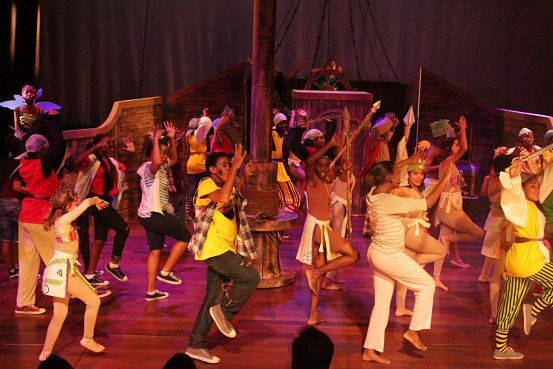 STAGE MAGIC: Watching the Jamaica Junior Theatre Company’s (JJTC) production of Pan at the Philip Sherlock Centre, it becomes immediately clear that a lot of hard work and detail went into the preparation process. The whole thing comes together splendidly, and the show’s art direction is by far its strongest asset. The show looks and sounds fabulous. The spirited young team running things at the JMTC these days (Danielle Stiebel, Jodi HoLung, Samantha Chin-Yee, et al) is a wildly imaginative bunch who don’t shy away from bold moves and creative risks. To say the least, they ought to be encouraged and strongly supported as we strive to keep rousing musical theatre alive in Jamaica. Kudos! MASTER CLASS: Watson (centre), spending time with students Katrina Abrahams and Sebastian Elliott, June 2015. Speaking with a local newspaper earlier this week in the wake of her husband’s death, Doreen Watson expressed her belief that among the persons who will most greatly miss Barrington Watson are his students who looked to him as mentor and inspiration. In hindsight, we understand why. TALLAWAH was the last online publication to talk with Watson at length. Last June, we met for a face-to-face interview that coincided with an art show at Old Hope Road’s Gallery Barrington (organized by Kingston on the Edge), featuring the legendary artist and a handful of his students showcasing some of their finest works and fielding questions about passion and process. A truly memorable occasion. Barry was absolutely generous and candid as he reflected on his life and his light. A light that has now flickered out. By all accounts, Watson lived to tell stories with his paintbrush and inspire others, including Jamaica’s emerging generation of artists. And he was good at what he did. As a rising star in his heyday, he was considered a unique talent among his peers, and the Jamaican art world quickly made room for his extravagant visual appetites and exquisite eye. Watson, whose most well-known pieces include Mother and Child (1958) and Conversation (1981), hailed from Hanover but attended Kingston College before enrolling at London’s Royal College of Art. A member of the Order of Jamaica and a recipient of the Gold Musgrave Medal from the Institute of Jamaica, he held the distinction of serving as the first director of studies at the Jamaica School of Arts and Crafts (now a part of the Edna Manley College of the Visual and Performing Arts). ICONIC PRESENCE: "Only in Jamaica," LKJ insists, "has dancehall overshadowed reggae." A 2005 Silver Musgrave Medallist, the author of five poetry collections, the first Black poet featured in the Penguin Classics Series (Mi Revalueshanary Fren) and the founder of LKJ Records, Johnson says back in the day he found himself morphing into an avid reggae collector and soon embarked on the path to becoming a reggae poet. THE MESSENGER: "I didn't see myself as a reggae artiste," admits Johnson, 63, renowned for his brilliant poems. 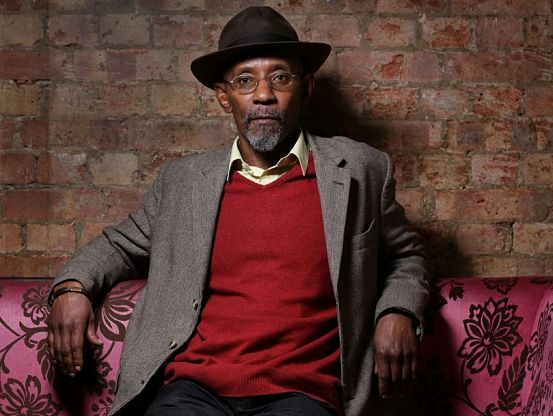 To understand how and why Linton Kwesi Johnson became a poet and revolutionary is to take a trip down memory lane and start at the very beginning. It’s a journey that references everything and everyone from Brixton and W.E.B DuBois to Andrew Salkey and the captivating power of reggae. A journey encompassing several decades, quite a few continents and at least one instance of police brutality. All that and more came to light during Johnson’s “Reggae Talk” inside UWI Mona’s Neville Hall Lecture Theatre on Tuesday evening, for a presentation dubbed “Reggae by Accident.” The title speaks volumes of how LKJ became the man he became. Linton Johnson was born and raised in Chapelton, Clarendon, but he moved to London in 1963 as a young chap, and his life would never be the same. Though a stranger in a strange land, it was while living in England that he discovered his calling. He became a member of the Black Panthers, devouring “Black consciousness” literature, including a copy of DuBois’s seminal The Souls of Black Folk, which changed the way he read a book. “It stirred something in me,” Johnson recalls. Then he had an epiphany. “After being exposed to so much African-American poetry, blues poetry and British poetry, I said to myself, ‘I want to write reggae poetry.’” His first attempt came in 1972, coinciding with a vicious beating he got from the Brixton police for writing down their information after witnessing them having an altercation with another party. Add to that the British climate of socio-economic hardships, segregation and victimization, which largely inspired his first book Voices of the Living and the Dead. He was anxious to get it published, but it was rejected by many publishers. Salkey was not the only trooper LKJ had in his corner. 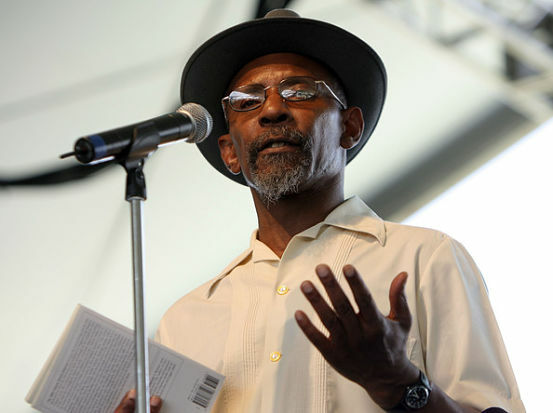 He got a lot of encouragement from playwright Yvonne Brewster, “a pat on the back” from Sam Selvon, and the list goes on. “It gave me enormous confidence to get the nod from people I had tremendous respect for,” the poet recalls. Bigger things were on the way and, by 1975 – at the plum age of 25 – he did his first dub recording. And that’s when things really began to take off. 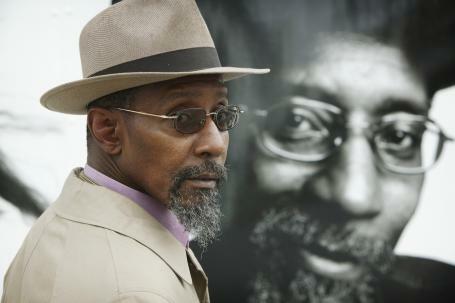 “Because I was developing this reputation as poet in the UK, I was approached by a filmmaker who wanted to make a documentary about me,” Johnson remembers. It eventually aired on the BBC to rave reviews. By this time, the name Linton Kwesi Johnson had gone global and he started getting invitations to do concerts and other performances from all over Europe. His gigs in France and Germany were particularly memorable. “The money sweet mi,” he admits, laughing. Then the big man came calling. He signed a deal with Chris Blackwell’s Island Records to make two albums – Forces of Victory and Bass Culture. “They did so well that Blackwell eventually offered me a six-album deal and I said no. And you should have seen his face,” Johnson remembers. “I didn’t see myself as a reggae artiste.” But he eventually caved in and did a couple more albums for Blackwell: LKJ in Dub and Making History. Then he had another epiphany: why not start his own record label? And that’s how LKJ Records was born in 1981. “But it didn’t take off until around the end of the 1980s, early ’90s,” he says. 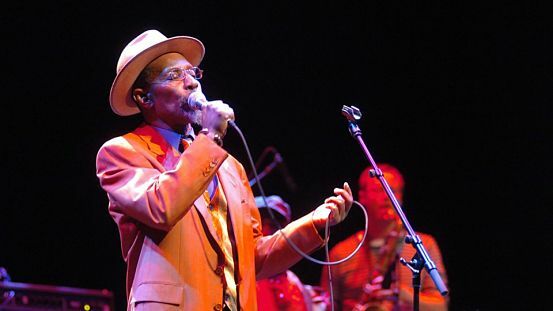 Johnson’s first release on LKJ Records was the Jamaican Mikey Smith’s popular “Mi Can’t Believe It.” And it just goes to show that though he spent so many years away from the island, LKJ still identified as Jamaican. Even his speaking voice, decades later, heartily suggests upper Clarendon. Johnson remembers coming back to Jamaica, circa the mid-1970s, to do some research. As an artiste, he was relatively unknown by the masses. It was Mervyn Morris who introduced him to the likes of Oku Onuora, Mikey Smith and others – then students at the Jamaica School of Drama, who were leading the revolutionary dub poetry movement. When Johnson first heard them he was pleasantly stunned. “I instantly felt some validity to know that what I was doing back in England was being done by others here in Jamaica,” he says. As the years went by and he morphed into an international sensation, LKJ became convinced it would soon be time to hang up the mic. 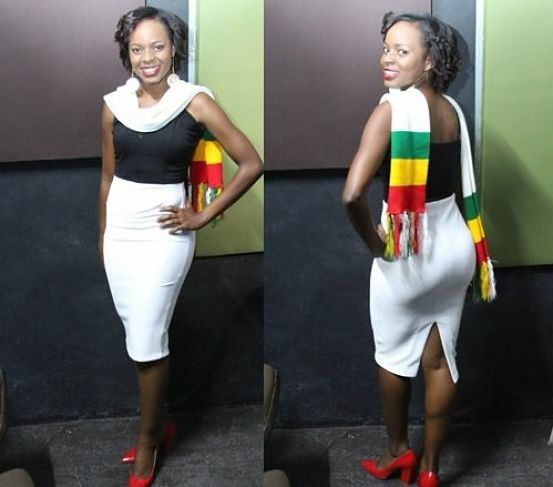 “I retired because I still felt that reggae was not the thing for me,” the icon says now. Besides, as a family man and a businessman, there were other things he wanted to do. LKJ, who is seldom seen without his top hat and spectacles, says he lives with no regrets. At least once per year, he flies in from England to spend time with his mother in Montego Bay. THE BRIGHT SIDE: Viibrant colour and sonic power add to the musical's overall appeal. 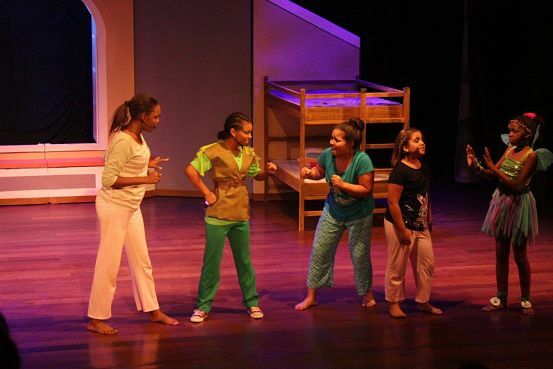 If you happen to be in the vicinity of the UWI Mona Campus this weekend, please drop by the Philip Sherlock Centre to see the Jamaica Junior Theatre Company’s Pan. You are in for a rollicking good time. A thrilling, tuneful song-and-dance hit, the show is brought to life by an energetic group of teenagers whose youthful exuberance go hand in hand with the magical spirit of adventure that the show celebrates. Peter Pan may be the boy who refused to grow up, but in productions across the globe (Broadway included), the role is often turned over to a young lady. Most recently, Allison Williams (HBO’s Girls) got to play the boy in green for NBC’s Peter Pan Live! Now, the JJTC has followed suit, tapping Zoe Daniele Chin Sang to fill the role. A petite pixie-muse with a big voice, she brings panache and winning charisma to the part, even fitting snugly into the Robin Hood-esque costumes. As the story goes, Pan (ever looking for some trouble to get into) pays a night-time visit to the Darlings – Wendy (Kiandra Edwards), Michelle (Paige Andrade) and Simone (Gabrielle Mair) – and with (reluctant) aid from his fairy sidekick Tinkerbell aka Tink (Courtni Spencer) sprinkles them with fairy dust. Before you can say 1, 2, 3, they’re off sailing through the clouds headed for Never-Never-Land. It’s a dream come true for these impressionable kids whose doting parents (Andrew Laidley and Sydnie Greaves) don’t have a clue that they’ve left the house. It’s now up to Wendy to play big sister. Basking in their newfound freedom, the girls bond with “natives” (the coconut-loving Lost Ones), but in a place like Never-Never-Land, trouble is never far away. 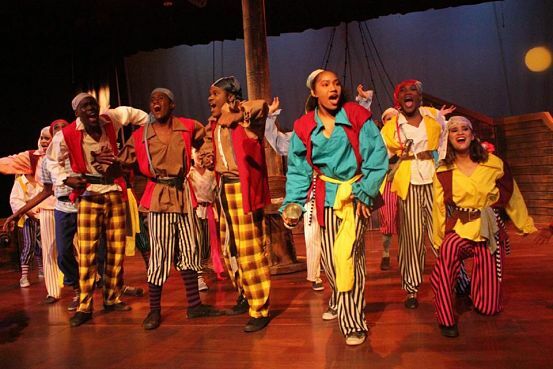 Soon, the Darlings become the target of some ruthless pirates, whose foul-tempered leader Captain Hook (Philip Wheatle, highly commendable) is hungry for revenge against Pan for the loss of a hand. Traps are set, battle lines are drawn, setting the stage for an epic showdown that brings the show to a booming climax. Though the final scenes in the production feel hastened, the young performers are so innocently committed to what they’re doing, you really don’t feel like complaining. Overall, the show looks good and the music sounds wonderful. Numbers like “Pure Imagination”, “Anything Can Happen” and the eternally optimistic “Keep on Dreaming” are standouts. FIT TO SPRINT: The technical efficiency of athletes like Chris Taylor (up front), says Clarke, is now being improved. 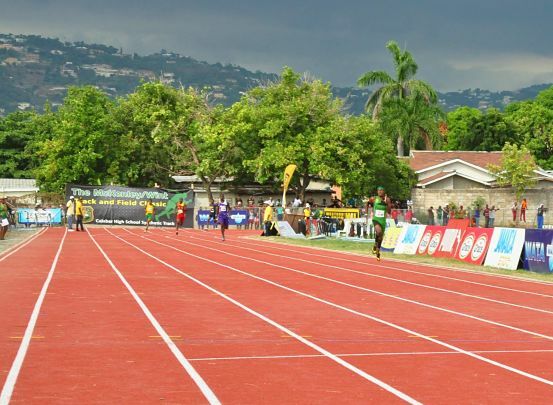 For coach Michael Clarke, the best thing about having a new synthetic six-lane track at Calabar High is that now he has a first-class surface on which to train his boys for the highly competitive track-and-field seasons ahead. After all, the Rabalac Lions are gunning for their fifth consecutive hold on the ISSA Boys Champs trophy this year. That Calabar High is the first Jamaican high school to make such a coveted addition to their sports programme is only dwarfed by the fact that they are the first secondary institution in the English-speaking Caribbean to make such a move. The Calabar Old Boys’ Association must be immensely proud, not to mention Principal Albert Corcho, who told us of the plans last year of the plans they were making, and Prime Minister Portia Simpson Miller, who officially unveiled the track with a fierce sprint of her own on Friday. Meanwhile, the McKenley/Wint Track & Field Classic represents Calabar’s homage to two Jamaican legends of the sport, Herb McKenley and Arthur Wint, whose relatives were on hand to receive special tokens during the meet’s opening ceremony on Saturday. 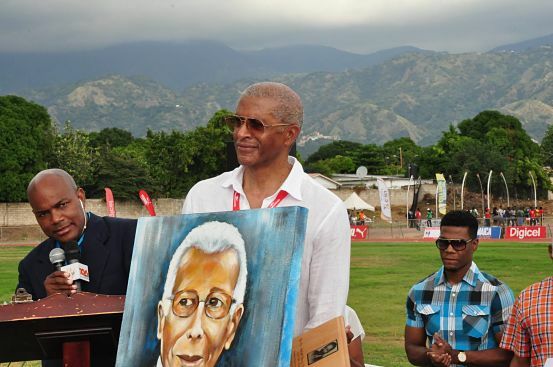 IN THE FRAME: McKenley, with a piece of art depicting his late father at Saturday's track meet at his alma mater, Calabar High. Below, a vintage shot of Herb McKenley. TALLAWAH: How does it feel to see your father’s legacy and memory honoured in this way? Mike McKenley: It’s just a feeling of tremendous pride. His beginnings started at Calabar and grew into the legacy that the country now experiences. He always said that Jamaica’s greatest success lies in its people, and this field of dreams that we’ve been fortunately given is where the next generation of Herb McKenleys and Arthur Wints and other legends will rise from. TALLAWAH: And I’m sure the rest of the family feels the same way. M.M. : Absolutely. It’s a tremendous responsibility. The legacy is left to myself, my brother and my sisters, and it’s a responsibility that we take very seriously, in respect of his contributions to Jamaica and to Calabar High School. TALLAWAH: Would it be a stretch to say that Herb McKenley deserves to be made a National Hero? 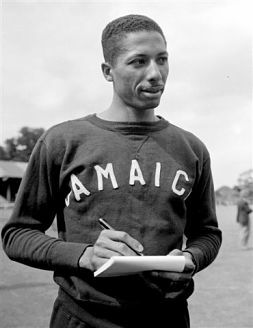 TALLAWAH: What would he have to say about Jamaica’s current wave of world-beating track-and-field superstars? M.M. : I think he would be excited, he would be proud of what we have accomplished as a nation. He would be immensely proud of the contributions that Calabar athletes have made to the nation. He would be happy to see that what he helped to establish was being cemented and nurtured. And I believe he’s watching. TALLAWAH: What’s life like for you these days? M.M. : I live in Atlanta. I work in retail. I work with Giorgio Armani, which is a luxury brand. I’ve been in retail for 33 years. I worked with Saks Fifth Avenue and I’ve also worked with Neiman Marcus. So a lot of the things that I learnt at Calabar [about] commitment, focus, discipline and hard work and living up to that motto still live with me, in terms of my day-to-day experiences. I remember telling somebody recently that one of the most gratifying experiences of my life was being a young man attending Calabar. It’s been a long time. That was in the ’70s. And to see what still flourishes makes me proud, makes me feel that my father would be gratified and happy to see the sons of Rabalac flourishing. TALLAWAH: What was Herb like as a father? M.M. : He was a disciplinarian. He was firm. He believed that nothing should be given; it should be earned, and that anything worth having demands sacrifice and hard work. And he taught me the lesson that before I ask for anything I must be willing to help myself. And these are the things I carry on from what he has taught me and I’m now trying to pass on to my 10-year-old daughter. He was fun-loving. He could be very curious, and my sisters and brothers say I’m a replica of him. TALLAWAH: That you’ve inherited these qualities. M.M. : Yes, and one of the things I hope our young people understand, whether you’re a Calabar old boy or a KC old boy, is that we are Jamaicans first. We must invest in each other because that will continue the prosperity and success of who we are as a people. And that’s what he believed. STAGE PRESENCE: Reid (right) and young costar Dania Brown in Force Ripe. Silvera is no stranger to bringing vivacity and verve to the role of strong Jamaican women, and in Dahlia Harris’ side-splittingly funny comedy-drama, her Mini-Bar is a mix of unflappable warrior and thoughtful matriarch, whose maternal instincts are as macca-sharp as her ‘tracing’ vocabulary. The Actor Boy winner proved she can carry an entire show on her slender shoulders, slipping into the role of an illiterate prostitute whose chance encounter with an aging man of letters (Hugh King) sets them both on a course that forever changes their lives. Maye has played the rough-around-the-edges type in numerous outings before, but here she unearths the kind of dramatic depth we always knew she had within her. Stealing scenes opposite seasoned colleagues Michael Nicholson and David Tulloch, Barrett provided audiences with nonstop comic relief, as a revivalist sister who gets regular “text messages” from the Holy Spirit. Seriously. A solid addition to a body of work that already includes standout roles in Thicker than Water and Stanley, Fay, Pularchie & P.
The most intriguing thing about seeing Reid portray a monstrous mother in this heated domestic drama is how much her character closely resembles Monique’s role in Precious. We don’t necessarily share her outlook or agree with (some of) her choices, but for the most part we understand where she’s coming from, and the anger (rooted in pain and disappointment) that seems to drive her. CHARACTER WORK: Hendricks and Rowe starring in Samson & Di Liar. After almost 50 years of delivering stage performances, Johnson still knows how to win us over with that mix of fatherly charm and riveting stage presence. 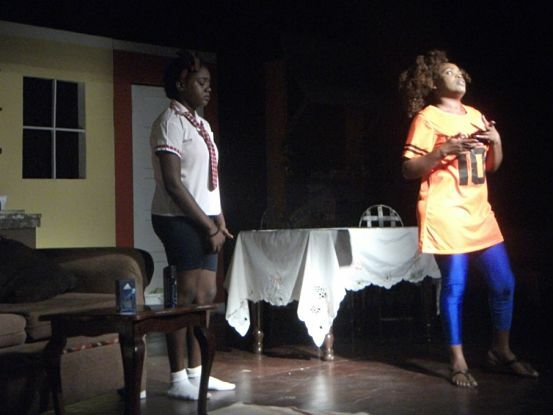 It goes a long way in anchoring his knockout performance (opposite Deon Silvera and Maylynne Lowe) in Dahlia Harris’ endlessly funny potboiler about domestic drama and class relations in upper St. Andrew. Johnson at his best. Dr. Seefur is easily one of the most intriguing character portraits we’ve encountered on the Kingston stage all year. Brought to full-bodied life by the incomparable Campbell (with just the right blend of menace and vulnerability), the character is all no-nonsense verve, Jamaican bravado and cheeky punchlines. In other words, classic Glen Campbell. A talented rising star who’s been on our radar since wreaking havoc in Bad Apple, Amore digs even deeper this time around. Playing an aging police veteran whose extramarital dalliances have dire consequences, Amore musters up the conviction to offer a nuanced performance fuelled by emotional depth. We consider him the nephew of acting greats Andrew Brodber and Alwyn Scott. He hasn’t performed for theatre audiences in ages, but Hendricks showed he’s still a force to be reckoned with. In this supremely funny comedy-drama (brought to us by rookie producer Scarlett Beharie), Hendricks played a homeless man/deportee blessed with amazing musical talent. When he forms a duo with another a down-on-his-luck drifter (played by Ricky Rowe), hilarity ensues. Some of the greatest actors ever have long made it clear that it ain’t easy playing a “mad” person, but it can be loads of fun. Titus takes to the challenge with relish in Basil Dawkins’ latest effort, disappearing into the role of a son pushed to the brink by his father’s (Oliver Samuels) betrayal. To say the least, it’s Titus’ most memorable performance since starring in 2012’s Stanley Fay Pularchie & P at New Kingston’s Theatre Place. 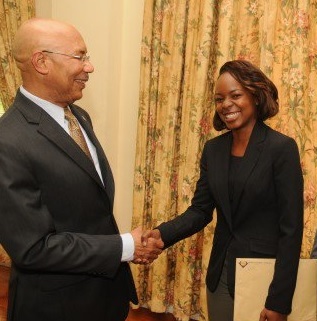 ALL ANGLES: "I realized from early that sense of leadership as a call on my life," shares the 24-year-old, pictured below with Governor-General Sir Patrick Allen and Terri-Karelle Reid. TALLAWAH: What does it mean to be the Rhodes Scholar of Jamaica? Sherona Forrester: It’s really about being an ambassador and a role model because to whom much is given, much is expected. So I have to set a very good example for the young people to follow. So far, so good. It has opened many doors; it has opened my eyes to the fact that there is need for a lot more role models in Jamaica. And I am striving to continue to be a positive impact on Jamaicans. TALLAWAH: Was it always a goal of yours to become this kind of ambassador for your country? S.F. : In some ways, yes. From my early days in church, I would stand out, and I was deputy head girl at my primary school [Mineral Heights Primary] and I was head girl at Glenmuir High. And then at UWI I captained several of my sports teams. So I realized from early that sense of leadership as a call on my life. And in the long run my ultimate goal is to become a philanthropist. TALLAWAH: You’ve accomplished so much in sports and academics since your coming-of-age years at the widely acclaimed Glenmuir High. What is it about that Clarendon-based school that it continues to produce so many champions and legends? S.F. : One thing is the interest that the teachers put into the students. School ends at three and some of them don’t leave ’til six o’clock every day. So they are investing in us and they help to mould us to believe in ourselves and to do our very best. Also, the school’s motto says, ‘Flagrans Veritatis Studio’ – Burning with the Zeal for Truth’ and that really drives us. And, finally, we believe in holistic development, so you are encouraged that it’s not enough to be bright, to just do well in school. You are also to participate in another activity. And when you participate in that activity you’re to do well and not to the detriment of your school work. So people tend to do well in all areas of life. TALLAWAH: Apart from landing the prestigious Rhodes scholarship to Oxford University, what do you consider your greatest achievement? S.F. : So far, it’s representing my country at the highest level in football, with the Reggae Girlz last year on our quest to qualify for the World Cup. That has probably been my greatest feat, aside from, of course, becoming the Rhodes Scholar. TALLAWAH: Speaking of sports, did the whole Chris Gayle/‘Blushgate’ episode take you by surprise? S.F. : (Laughs). It was a bit surprising. That’s all I have to say. 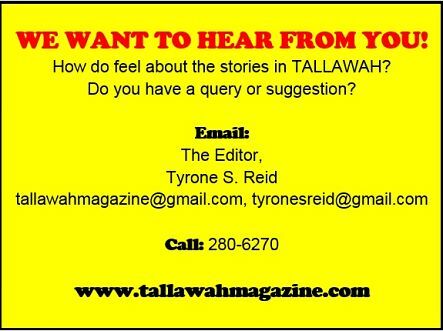 TALLAWAH: Ultimately, what kind of contribution do you want to make nationally? S.F. : Nationally, I want to have a foundation that focusses on females in sports. My foundation will be geared towards the youth because I realize that with investment, the rewards can be great. So I plan to invest heavily in the development of the youths, especially mentally, so that, not just in sports, they will excel in all areas of life. TALLAWAH: What’s your advice for young Jamaicans who have ambitions of one day ascending to your level? S.F. : If you want good, yuh nose haffi run. You have to set a plan, you have to work towards it. So if your plan is to get to X, if [factors] in your life won’t get you to that point you have to let them go. You need people who are positive around you to help you get to where you’re going, and negativity just kills that spirit of thriving and moving forward. And you have to know that that comes with discipline, determination and hard work. MOVIES: My favourite movie is In Time. It’s a movie where time is money, and I’m very cognizant of that fact. BOOKS: I’m not much of reader but growing up I loved books about geography and animals. FOOD: I love bread, run-down and toto. MUSICIANS: I like John Legend. I like inspiring music. MENTORS: My high school teacher who became my music teacher and mother, Mrs. Doreen O’Connor, stands out. She really took me under her wing. And also Cedella Marley. Her investment [in the Reggae Girlz] made me so much better, in terms of my athletic ability and being exposed to greater resources, travelling and experiencing various levels of expertise. HELPING HANDS: Students representing the Jeun-Espoire Jamaique visiting residents at the home in March 2014. Every year the National Leadership Prayer Breakfast (NLPB) organizing committee takes on an outreach project that they support through funds raised at the annual event. This year, all the proceeds will benefit the Eira Schrader Home for the Aged, a down-on-its-luck residential facility for homeless senior citizens located in the Federal Gardens, Trench Town. Named after the Swiss native who established the home back in October 1986, the home is capable of accommodating close to 25 residents, but due to the deterioration of the facility, it’s now limited to less than 10 persons, ranging in age from 70 to 85 years. The project was brought to the attention of the NLPB committee following a commitment given by the Errol Rattray Evangelistic Association (EREA) and 12 churches that participated in a seven-month operation in Trench Town, culminating in an evangelistic crusade. With the support of the Trench Town Ministers Fraternal they have decided to throw their full support behind this worthy cause – a home (catering to a handful of the nation’s most vulnerable citizens) that has fallen on hard times. Schrader, the Good Samaritan who started the facility could maintain it for only five years. Since 1991, that task has fallen to community hero Lloyd Ferguson, who has been supervising and maintaining operations out of his own pocket, with aid from the Bob Marley Foundation (small salaries for two staff members), the Jamaica Red Cross (one square meal Mondays-Fridays) and the Rose Town Christian Church (cooking gas). Mr. Ferguson could not be reached for comment, but Dr. Garth hails him as a stalwart fighting the good fight. “[He] has done very well for the residents. In fact, he’s one of the persons who physically helped to build that place, and when you see how badly run-down it is, it’s really a shame,” Dr. Garth points out. 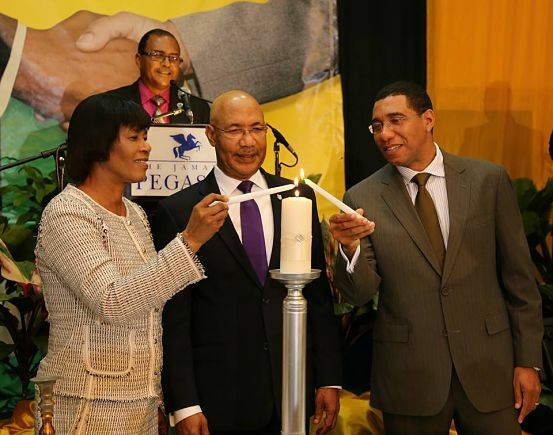 LET THERE BE LIGHT: Simpson-Miller, Sir Patrick Allen and Holness participate in a symbolic show of unity at the event. In a fired-up and no-holds-barred keynote address at Thursday’s National Leadership Prayer Breakfast – the 36th staging – at the Jamaica Pegasus Hotel in New Kingston, Pastor Glen Octavius Samuels urged Jamaicans at all strata of the society to pull together in the fight against the myriad social ills plaguing the country at this time. Samuels, President of the West Jamaica Conference of Seventh-Day Adventists was particularly vociferous while drawing attention to such issues at the disheartening crime rate statistics, the “overburdened and underfunded” health-care system and moral decay affecting wholesome family life. 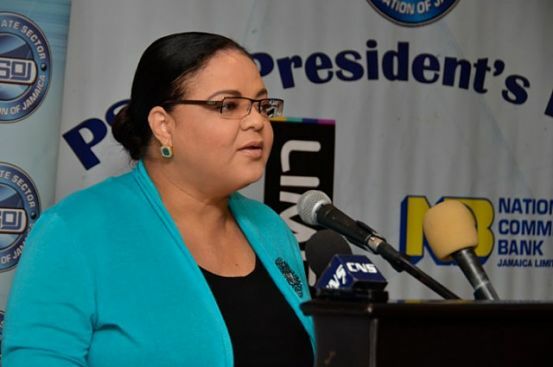 “It is not just up to the political leaders, but in leadership at all levels, if we are going to build a nation to the honour of God,” Samuels emphasized. “We cannot tax our way out of all our problems. There is nothing wrong with Jamaica that cannot be fixed with what is right with Jamaica,” he added, stressing the need for transparency and accountability at all levels. The strongest audience reaction during Pastor Samuels’ presentation came, however, when he put the focus on morality and the state of the Jamaican family. “There is too much irresponsibility among our male and female folk. We need more responsible father in this country. It is not enough to be a sperm donor,” he said. Each year, the NLPB organizing committee chooses an appropriate theme to reflect the church’s message to the nation. The 2016 theme is “Righteousness exalts the Nation.” First held in January 1981, following the General Elections of 1980, the National Leadership Prayer Breakfast arose out of a need to foster greater national unity, particularly among political and civic leaders. Governor General Sir Patrick Allen, Opposition Leader Andrew Holness and Prime Minister Portia Simpson-Miller were all in attendance this year. ART & LIFE: Brown's latest fuses tuneful R&B and modern hip-hop sounds. To say that Chris Brown has hit a steep evolutionary curve since he burst onto the scene back in the early 2000s would be an epic understatement. From weathering multiple crises to becoming a father last year, the 28-year-old Philly-bred crooner is on his grown man these days. 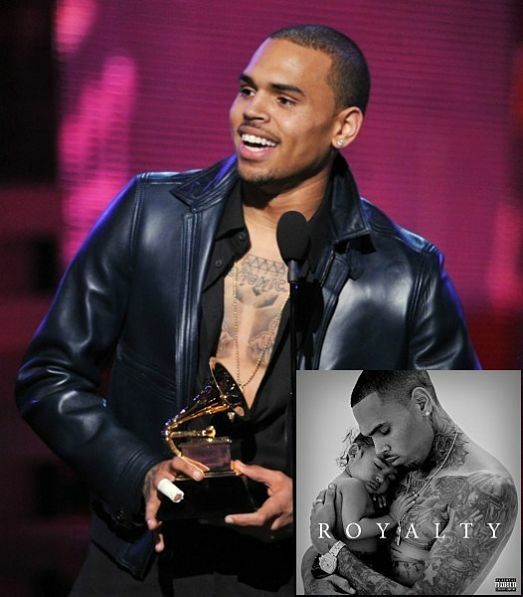 And his new album, Royalty, heralds this latest chapter in an intriguing and continuing success story. A mix of the old Chris Brown that fans have grown accustomed to and the musings of a modern R&B-hip hop thug, Royalty delivers one tuneful highlight after another, which is saying something for an album that largely explores sexuality and the perks of living the good life. At its best, though, the album showcases the singer’s impressive vocal range. They’re not all runaway hits, but each track on Royalty stands robustly on its own. From the bold-faced opener “Back to Sleep” (about late-night hanky-panky) to the sure-footed closer “Little More”, Chris cruises along with assured delivery and a supreme confidence in his material. Try to sit still during a club-ready up-tempo jam like “Zero” (about the highs and lows of young love) or be unmoved by the heartfelt strains of tunes like “Wrist” and “Proof” – both of which are perfect for radio and feature clever songwriting. For the most part, the lion’s share of these tracks would not be out of place on albums by R. Kelly and Usher, two R&B alphas to whom younger cats like Brown owe a great deal for paving the way and showing how it’s done. Of course, Chris Brown has gone his own way, creating a musical identity that’s instantly recognizable but with a certain respect for the likes of Michael Jackson. HIGH PERFORMANCE: Sunshine Girls to welcome back former head coach? 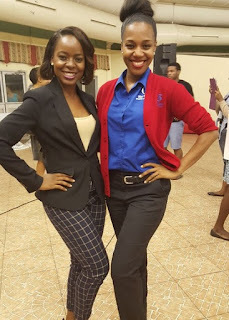 At the recent National Sportsman and Sportswoman of the Year Awards in Kingston, TALLAWAH caught up with netball legend Connie Francis, who revealed that she could be returning to full-time coaching duties with the senior Sunshine Girls sometime this year. “I’m supposed to be doing some work with the girls on a regular basis, but I don’t want to say too much about it until it’s been confirmed,” she told us during a brief interview at the ceremony. 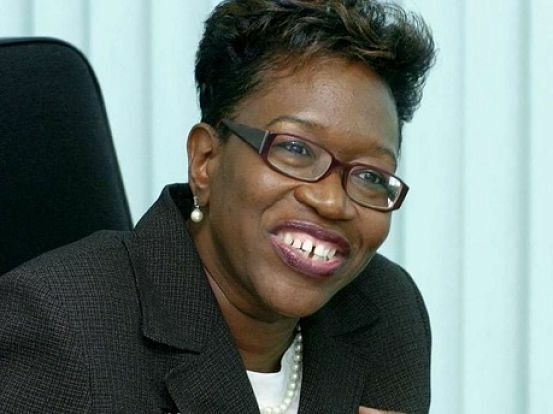 Her guarded optimism is understandable, given the status quo at Netball Jamaica, which has just welcomed a new president (Paula Daley-Morris) in the wake of Marva Bernard’s departure after 10 years in the post. Technical Director Jill McIntosh’s time with the national programme has run its course, but what will a shake-up in the rest of the coaching staff mean for Minette Reynolds and her assistant Annette Daley? We say all hands on deck, as the girls look to reclaim their place among the top three competing nations in the world. 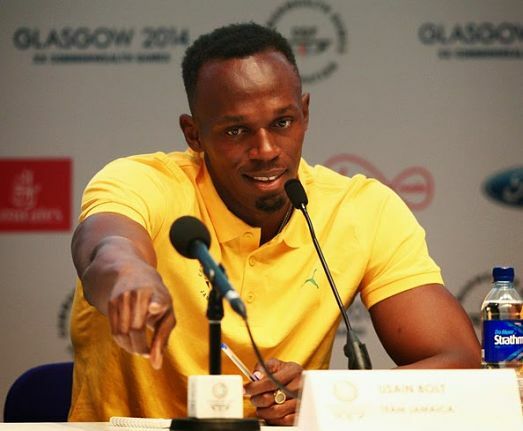 Reigning Sportsman of the Year, Usain Bolt, gets asked ad nauseam about his plans for life after track-and-field. That said, we welcome the fact that he’s giving consideration to becoming an ambassador for the sport he so cherishes. “Whenever I do retire, I will try and stay in the sport,” he tells The Gleaner, which recently gave him an award for his outstanding achievements on the track last year, as one of their 2015 honorees. Lascelles Chin and Dr. Peter Phillips are among the others. “I will try to help motivate people or be an ambassador for the sport in the best way that I can – and just try to keep helping the sport and keep pushing it forward.” The Gleaner honour is the latest accolade to float Bolt’s way in recent weeks, the chief highlight being his sixth hold on the National Sportsman of the Year crown. 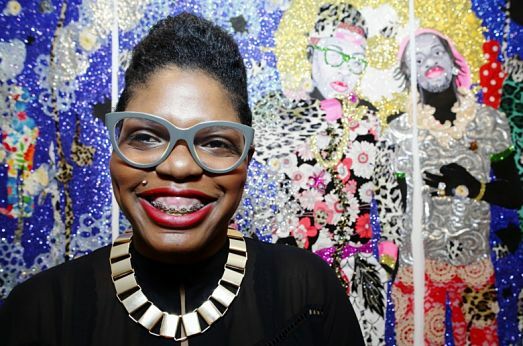 Her wildly imaginative and boundary-pushing creations can be found in art collections across Jamaica and the United States and rank high among the highlights in the current ‘Masculinities’ show at the National Gallery. Now comes news that avant-garde artist Ebony Patterson will open a one-piece solo exhibition (yes, you read right) at the Studio Harlem in New York on March 24. Titled “…when they grow up…”, the work will be on view through June 26.